Can I see a show of hands? Who here has heard of or uses Netflix? I'm pretty sure I've seen all your hands in the air. Now, who here has heard of or uses Beachbody on Demand or BOD? Not nearly as many hands in the air that time. Can I introduce you? Seriously, BOD could very well become your best friend. I use it EVERY SINGLE DAY. Shall we dig in? So what is Beachbody on Demand? It's a digital arena where you can access and stream every single Beachbody program in their library. Titles from the classics - like P90X or TurboFire - to the newest programs like Core De Force and the new Yoga Studio. It includes the videos as well as the program materials. Most programs also have FAQs to answer those questions that almost inevitably come up! So why do *I* love Beachbody on Demand? I get to try new programs. I gotta tell you: I have never bought Country Heat or Core De Force because they really didn't appeal to *me*. However, my mom LOVES country music, and I KNEW she'd love Country Heat. It was so easy to go downstairs, turn on Beachbody on Demand, and try Country Heat. And the best part? Even *I* had fun with it! Would I buy the entire program? No, most likely not. But I love that it's literally at my fingertips any time I get the itch to do it. I'm lazy. Truly, I am lazy. Do you know how amazing it is to *not* have to dig out my DVDs every day? To *not* have to figure out which one is due each day? To *not* have to worry about one that is skipping (yes, that has happened and it drives me nuts). It is so convenient! This kind of goes along with #2, but it really helps when I'm not home. Do you have any idea how nice it is to pull up the 21 Day Fix meal plan guidelines on my phone, no matter where I am? Or, if I forget what's on the schedule today/tomorrow/next month, I can just pull it up on my phone at any time, anywhere. When I travel out of the country, I can still take my workouts with me - without packing space-eating DVDs. Just last November, the mister and I went to Poland, and I was able to take seven days' worth of workouts on my iPad/iPhone that didn't require cellular service or wifi. Now, this download feature is currently only available on ios devices, but the android version is coming SOON! I get to do the deluxe version of every single program. In addition to having the entire Beachbody library online, those programs have every single workout included. Yes, including the deluxe workouts. And can I tell you - the deluxe workouts on Hammer and Chisel? Killer. Just take the 15 minute glute chisel....walking HURT for 2 DAYS after doing that one the first time. Beachbody on Demand is a boredom buster. Don't want to commit to one specific program? Bored with your current program? BOD has this thing called the Challenge Du Jour - every day of the week has a different workout, and each week is different. You still get a complete package because each day has a different focus. It's like experiencing all the different trainers in one ever-changing program. I get to workout outside. Doing yoga outside can be amazing. The birds are singing. The grass is green and soft. There's fresh air and the scent of flowers. And then, of course, the uneven ground provides a greater challenge. There's just something about doing yoga outside. 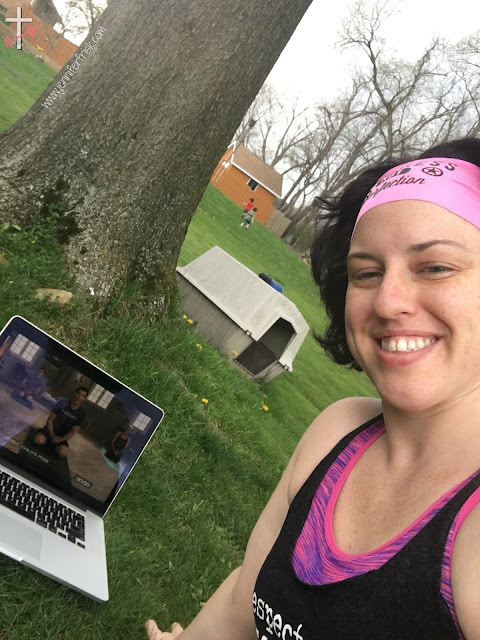 Beachbody on Demand allows me to take my scheduled yoga workout to my backyard. I could, in all reality, keep going with reasons why I love BOD. Want to learn more? Please feel free to reach out to me, and let's talk some more!